OSWEGO — The Circle of Security Parenting program to break the cycle of abuse and neglect of children in Oswego County — founded locally by SUNY Oswego psychology chair Dr. Matt Dykas — recently made a big leap in momentum. Stacy Alvord, county commissioner of social services, speaks March 8 in SUNY Oswego’s Penfield Library in support of Circle of Security, an internationally recognized program, and its 42 candidate trainers to provide parents with vital skills and insights, in order to reduce the incidence of child abuse and neglect. At the 2019 kickoff session March 8 in Penfield Library, Circle of Security organizers welcomed a new class of 42 candidate trainers from 17 agencies, organizations and institutions. That’s triple the number of last year’s class and represents strong community-wide support of the internationally respected program, Dykas said. Each trainer, upon earning certification, would conduct a recommended minimum of two parental training courses a year with three to ten parents in each class. The Circle of Security program puts 75 years of attachment theory into direct practice, providing parents with vital tools to recognize their children’s needs and to respond with understanding, reassurance and affection. “This program is literally changing people’s lives,” said Dykas. He later told the audience about one parent who had to miss some of the training in order to give birth, but later returned because she wanted to finish the course for the benefit of her baby. 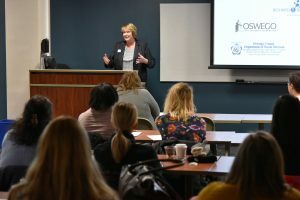 Dykas, who first began to spread the word about Circle of Security Parenting in 2012, formed Prevention Support Partners of Oswego County, headquartered at SUNY Oswego, with the support of college President Deborah F. Stanley. Its goal is to advocate for evidence-based prevention programs that attain positive outcomes for children, adults and families. “We are glad Matt came to us, and we are thrilled to support him in this,” Kristi Eck, chief of staff to President Stanley, told candidate trainers, program alumni and community organization representatives. The Richard S. Shineman Foundation has made three grants totaling about $60,000 to help launch and expand the Circle of Security program in Oswego County, supporting scholarships for trainer candidates to attend the course in 2018 and this year. “We are really behind this effort because we believe in it,” said Karen Goetz, the Shineman Foundation’s executive director. The foundation makes grants to organizations and programs that have the potential for transformational change in the county. United Way of Oswego County recently also welcomed Circle of Security as a partner. “This is right in the lane of what we are looking for” in a partner, said Patrick Dewine, executive director of the community-wide organization. Train-the-trainer candidates this year hail from such not-for- profit organizations as Oswego County Opportunities, Child Advocacy Center of Oswego County, the Fulton City School District, Oswego City-County Youth Bureau, Elmcrest Children’s Center, the county Department of Social Services (DSS) and many more. Stacy Alvord, DSS commissioner in Oswego County, spoke at the kickoff session in support of the growing Circle of Security program as one of the vital keys to early intervention with parents of young children to break the cycle of generation-to-generation abuse and neglect. For more information, visit cnyattachmentnetwork.org or call Jessica Westberry, assistant director of Circle of Security Parenting, at 315-591-6047.